While her teammates are on campus preparing for the winter season, women’s alpine ski team captain Foreste Peterson ’18 is blazing her own trail. After training with the U.S. Ski Team’s World Cup team over the summer, Peterson took the fall term off and made her World Cup debut at Soelden, Austria on Oct. 28. Peterson, known to the Dartmouth ski team as “Fo,” qualified for the World Cup race by virtue of her world ranking. She finished as the top-ranked American in the NorAm last season. In a World Cup race, only the top 30 finishers from the first run qualify for a second run. Peterson’s time of 59.70 seconds landed her outside the top 30, less than a second behind American Olympic gold medalist Lindsey Vonn, who has 77 World Cup wins to her name. Vonn also missed the cutoff for the second run. Peterson has taken the fall term off, but she was on campus for the first month of the term to help welcome first-year ski team members, work out with the team and take on captain responsibilities. She plans to return to Dartmouth in the winter to continue racing with the College team. Currently, Peterson is in Colorado training with the U.S. National Ski Team, the only student invitee to do so. Her first race of the NorAm season is on Nov. 18 at Colorado’s Copper Mountain. Peterson, who has raced in the NCAA championship the past three years, is not new to big races. But the World Cup is a whole new stage with steeper hills, bigger crowds and professional competition. Peterson has excelled on the college circuit. During last year’s Carnival season, she won three giant slalom races and finished second in the Eastern Intercollegiate Ski Association giant slalom standings. At the NCAA Championships at Cannon Mountain, New Hampshire, she finished third in the slalom, an unexpected result because slalom has not historically been Peterson’s best event. She further impressed in NorAm races, finishing on the podium three times and in the top 10 in seven out of eight races. “I had never done this well on the NorAm circuit in years past so these results were unexpected to say the least,” Peterson said. Following her standout NorAm season, Peterson was invited to train with the U.S. Ski Team Europa Cup and World Cup teams. This entailed living in Park City, Utah and working out at the U.S. Ski Team’s Center of Excellence as well as traveling to New Zealand for a month of on-snow training. Women’s alpine coach John Dwyer thinks that this has already given Peterson quite the advantage. “She already has had about 40 days on snow, which is amazing,” Dwyer said. So where does Peterson go from here? According to Peterson, her biggest strengths are the ability to trust her skills and execute a plan that keeps her focused on race days. To men’s alpine ski team captain Thomas Woolson ’17, Peterson epitomizes preparation. “She is always pushing you to be better yourself, whether it’s in the gym or on the hill she is always an example to watch,” he said. Woolson considers Peterson’s ability to deal with pressure one of her “most impressive” qualities. 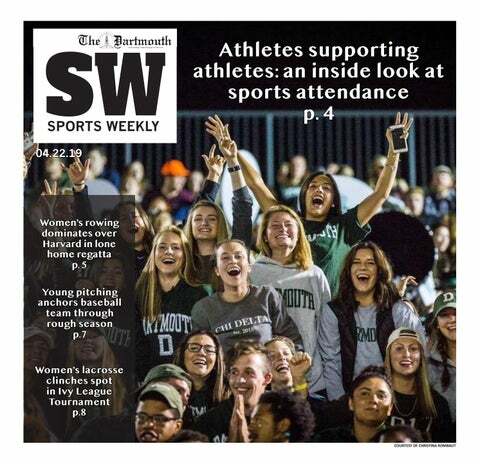 Peterson is expected to stand out in the Carnival season again this year as Dartmouth looks to improve on its fourth-place finish at last year’s national championship. “[Peterson] will be a hard athlete to replace when she graduates next year,” Dwyer said.